The U.S. dollar ended the day higher against all of the major currencies despite the relatively subdued reaction to the Federal Reserve's November monetary policy announcement. As expected the Fed unanimously decided to leave interest rates unchanged and their forward guidance unchanged. According to the FOMC statement, U.S. policymakers see economic activity rising at a solid rate despite the recent hurricanes. This positive outlook and their belief that the storms won't alter the economy's medium term course offset their concerns that inflation for items other than food and energy remained soft. With spending rising at a moderate rate, investment picking up, the labor market continuing to strengthen and unemployment declining, investors saw the statement as a green light for December tightening. After the rate decision, rate hike expectations for December increased from 82.8% to 92.3%. Many sources are also saying that Jerome Powell will be President Trump's pick for Fed Chair. As the market has fully discounted a Yellen departure, as long as Trump picks Powell or Taylor and not someone from left field, the dollar will rise as the uncertainty recedes. The announcement is expected on Thursday along with the Republicans' tax reform bill, which was delayed from today. Unless there are any unexpected surprises on either front, the dollar should rise on these announcements. With the FOMC rate decision behind us, the market will shift its focus to the Bank of England's monetary policy announcement. 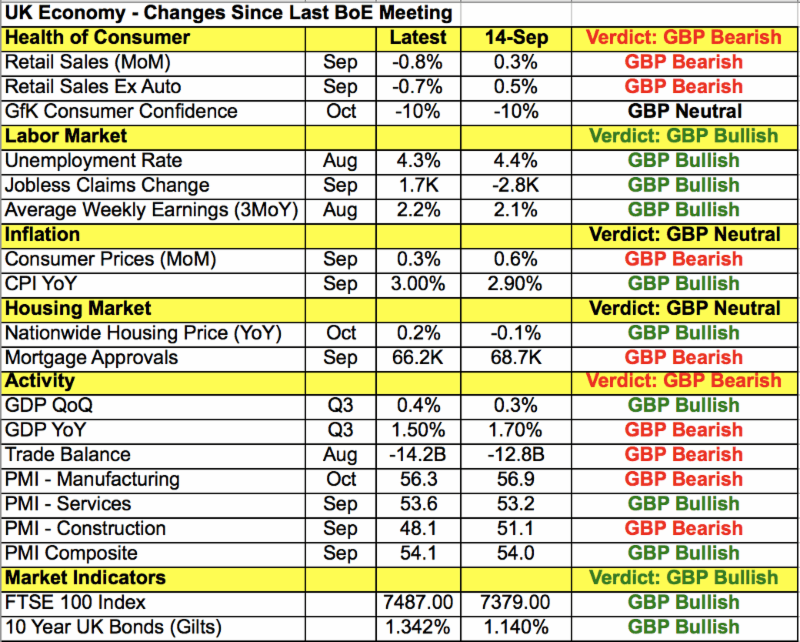 The market is pricing in a 90.4% chance of a hike tomorrow but we're not so sure that the BoE is ready to move especially given the larger trade deficit, recent weakness in manufacturing activity, retail sales and slowdown in CPI growth. Investors clearly feel different with the strength of sterling reinforcing rate hike expectations but market participants believe that even if the BoE stands pat in November, they'll hike in December with yearend rate hike expectations hovering just over 91%. These hawkish views were driven by the minutes from last month's BoE meeting, which revealed that a majority of MPC members see "scope for stimulus reduction in the coming months." On that same day, BoE Governor Carney confirmed that not only have the odds of a hike have increased but he is among the majority on the MPC who see the need to change stimulus. However since then, we've heard Carney say inflation is likely to have peaked in October. A hike could wait until December, but many investors believe the hike will happen in November because it will be accompanied by a Quarterly Inflation Report and a press conference that gives Carney the opportunity to explain the change and manage the market's future expectations. If the BoE hikes, it would be wildly positive for sterling and could take the currency up to 1.3350. Sterling will still rise if they leave rates unchanged but strongly suggest that a hike is coming in December but if they leave rates steady and suggest that a hike could still be a few meetings away, we could see GBP/USD hit 1.31. Tomorrow's BoE announcement will be particularly difficult to trade because aside from hike or no hike, the number of people who support the move (or lack thereof), their updated economic forecasts and forward guidance will all play a role in how the currency trades.